Barely able to contain my excitement that Starbucks have got some new flavours to try (I miss the honey and almond hot chocolate already) with Pistachio and Rose Mocha or a Burnt Caramel Latte, they then add to it by teaming up with Benefit for the whole of February! All you need to do is go along to your participating Benefit Counter (find yours here) and collect a pink coffee sleeve, seriously how cute are these? This sleeve gets you a Buy One Get One Free (Bogof) coffee for you and your #Bestfriend. 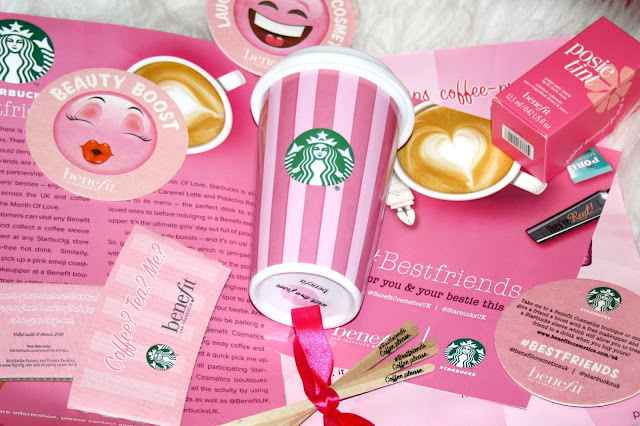 But that's not all... once you retrieve your coffee, ask the lovely Starbucks people for a special pink Emoji coaster and this gets you a free makeover at Benefit and whilst you are there, you can ask the lovely Benebabes which products will suit you, what brow shape you should have and anything else you have been dying to know. Sadly, the pink cup is not available. Finally if you are out and about in London, head to Carnaby Street and look out for the Bright Pink Van where the Benebabes will be handing out free coffee and cosmetics for those who need a quick pick-me-up on the go! What a great offer. I think I would have to give the free drink to my daughter as I'm not sure my husband would drink out of a pink cup! I need to try the rose and pistachio mocha, it sounds amazing! Great idea for the two brands to team up for February ... and a free makeover, what's not to love?! The burnt caramel latte is amazing! I tried that at the weekend. This sounds Amazing! what a great idea! Now going to stop off at my local Starbucks! Omg yes I am going into central soon so I will look out for these! I can't wait! That is such a fab offer. The new flavours sound lovely. Aaggghh I love benefit but don't like coffee- such a dilemma! wow, this is a great collaboration. Im a huge fan of both and I absolutely love that pink cup! I have a benefit counter where I work so will check it out. Oh how exciting! Starbucks and Benefit go great together and my daughter is a frequent Starbucks patron. I absolutely love the cup! Such a lovely idea! I love Starbucks and this cup is pretty. Ooohh, new flavours! I'm going to have to get together with my besties as we love a visit to Starbucks. Excellent! I have already taken advantage of this - it is such a great idea! I kind of want another one of those rose and pistachio mochas right now! What a great brand connection! Love that they've done this during Feb! It all looks super cute! Pistachio and Rose Mochas? Yes please! I thought this was a good brand collab. What a good deal. I love it when brands collaborate together! As an arch expert for Benefit Cosmetics, I was SO upset when I found out this isn't happening in the US! Hopefully soon, too too cute! Damn! I was only in London on Monday. Hopefully I will get there before the end of the month and take advantage of this! brilliant marketing idea! looks fabulous, i'm desperate to try the new pistachio and rose latte, even if I know its bad for me. OMG! OMG! This collab is a perfection! I wish I'm in London right now! How adorable! I'd love to do something like this in Australia! Aww! I didn't know I was supposed to ask for the coaster! I totally missed out on that part! Although I did manage to get the free coffee and a sample of the Porefessional, so I guess it's not all bad.